Virginia Classic Mustang Blog: Win a Free Mustang Part!!!! Browse through their online catalog and choose any product as your potential prize. The drawing will take place April 25, 2014 with 3 Lucky Winners! 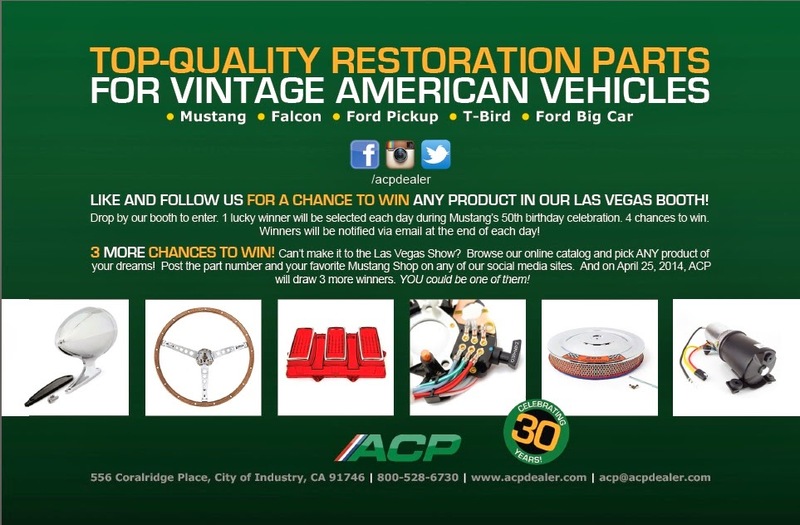 If you are attending the Mustang 50th Anniversary Event in Las Vegas from April 17-20, you can also visit ACP's booth. Mention us, Virginia Classic Mustang and choose an item from their large display as your potential prize. A drawing will be held at the end of each day. You will be notified by email if you win. Please note that this will not take place at the other 50th event in Charlotte on the same weekend.